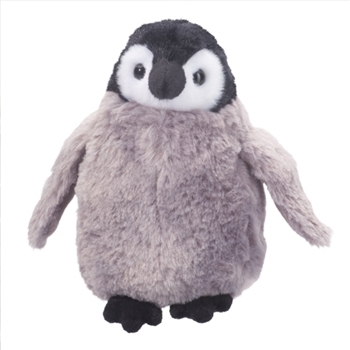 Cuddles the Little Plush Penguin Chick by Douglas is ready to grab a friend and cuddle up close! Our little stuffed penguin chick will stay by your side for years to come and bring you hours of joyful play time and quality snuggling. Featuring short and soft kohair fur and adorable little black eyes, this little penguin chick stuffed animal is certain to be an instant favorite for any young Arctic explorer and will delight any little adventurer that longs for big glaciers and the frigid cold. As with the entire line of Douglas Cuddle Toys, this plush penguin chick is made from all new, child safe materials, is rigorously tested for quality assurance, and meets or exceeds both the U.S. Government and the voluntary Toy Safety Standards. Recommended for ages two and up, Cuddles the Little Plush Penguin Chick is surface washable. Douglas is a family owned business that has been making heirloom level stuffed animals and toys since 1956. As with all of Douglas' superb stuffed animals, only the highest quality materials and craftsmanship are used in the construction of this stuffed penguin chick, and each stuffed animal is thoughtfully designed to evoke a sense of endearment and to give them that adorable look that clearly defines them as a Douglas Cuddle Toy. When you buy a Douglas Cuddle Toy, you can trust that you are buying quality.